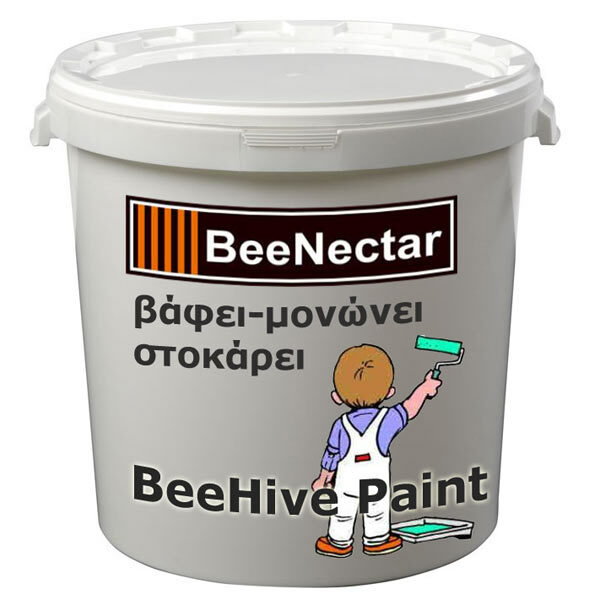 BeeHive-Paint (code 10014) fulfills 3 roles simultaneously : painting, stuccoing cracks and insulating. It offers 40% more insulation in the hive, has unique elasticity and durability and allows wood to breathe. It also protects the hive from moisture and due to its elasticity it does not crack. 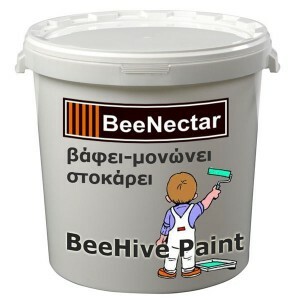 This product does not ignite and has great durability (5-8 years) and it is sufficient to paint over 30 2-storied hives. Apply 1-2 time(s) on the wooden surface of the hives. For the first time, add as much water as needed for the product to become watery and absorbed by the wood, as when using a primer. For the second time, wait until the first one has dried and then the dilution is up to 3% (ie a cap of coffee water in 1 kg of insulator). For old hives, scrub the tears or cracks, if any exist, and then follow the above instructions. This paint must be applied only on dry surfaces. To change the color, add plastic color or watercolor. It is better for each part of the hive that is painted, not to touch the other ones (place small wedges between the painted parts) until it dries out, so as to avoid getting glued together by the paint. If you want, you can use part of the content of the container, as long as you stir it well. The rest remaining in the container is kept for years without deteriorating, as long as you close the package tightly and store it in a cool place. It is available in packages of 15kg.